Come and join us on Saturday for a coffee and natter in church, and a chance to see our Christmas Crib. 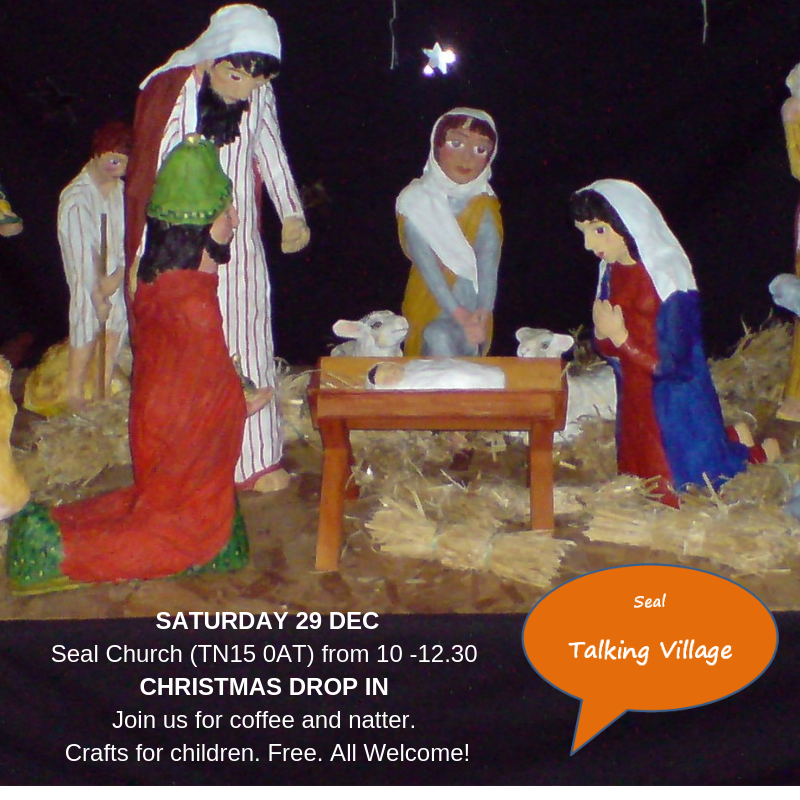 This is a Talking Village initiative, open to everyone. 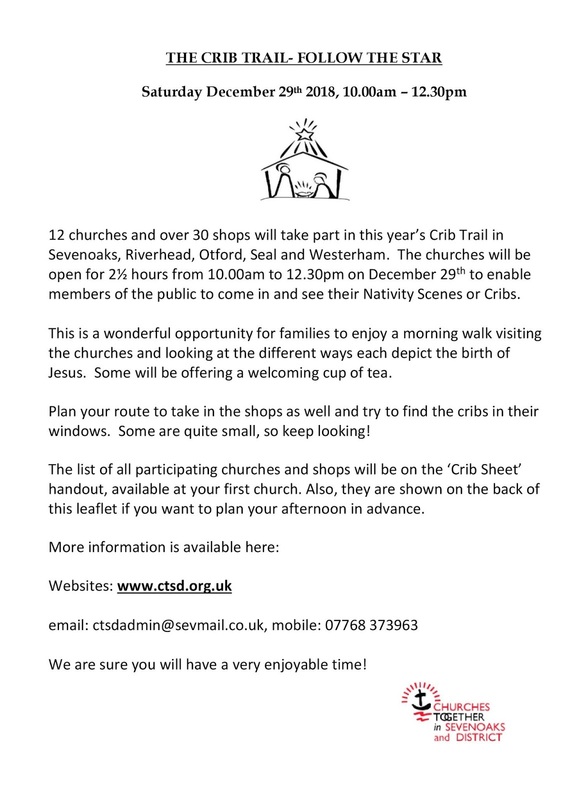 It is also part of the Sevenoaks crib trail - so you may want to drop in on the way to see the others, or you can just stay with us for as long as you like. Details of all the churches and shops displaying cribs are here. The final angelic appearance in our series is that of the angels to the shepherds outside Bethlehem. It starts with one angel, shining in glory, who tells them – ordinary shepherds – that the Messiah has been born in their own town, but he is then joined by a “multitude of the heavenly host”. It is as if heaven had broken through to earth in that moment, as if they are standing in the heavenly courts right there on the Bethlehem hillside. Like Jacob, whose vision of angels we looked at on Day 3, the shepherds discover that right here, where they are, is the “house of God and gate of heaven”. The angels have proclaimed that God himself is present in this tiny child who is lying in the manger. He is the message of God himself – not an angel, but a flesh and blood child – one of them. · As you hear the Christmas story once again, what is the message in it for you this year? What is God saying to you through it, and what are you going to do to respond to that message? · As you prepare to celebrate Christmas, think about the message your life gives to others. Are you a message which brings peace and joy? This is perhaps the most famous angelic appearance in the Bible, celebrated often in music and in art, where it has a whole genre of pictures – annunciations – named after it. 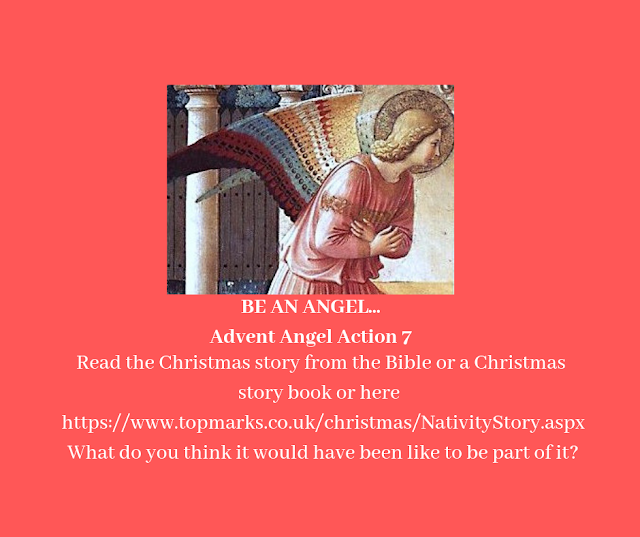 The angel Gabriel announces to Mary that she will have a child who will be the Messiah. Although we might think there is a limited number of ways in which one could paint this scene, every artist does so differently. In some, the angel is about to make his announcement, in others he has already done so, and Mary is shown reacting to it. In some there is joy, in others fear, and in others calm acceptance. We are so used to this story that it often loses some of its impact on us. In reality it is a moment when a (probably) very young woman hears news that will change her life, and which will expose her to the possibility of total ruin and danger. The son she will bear will not look after her in her old age, either. The ministry which is hinted at in the angel’s announcement will set him on a collision course with the powers of his time, and she will one day have to watch him die. All this makes her calm “let it be with me according to your word” all the more astonishing. 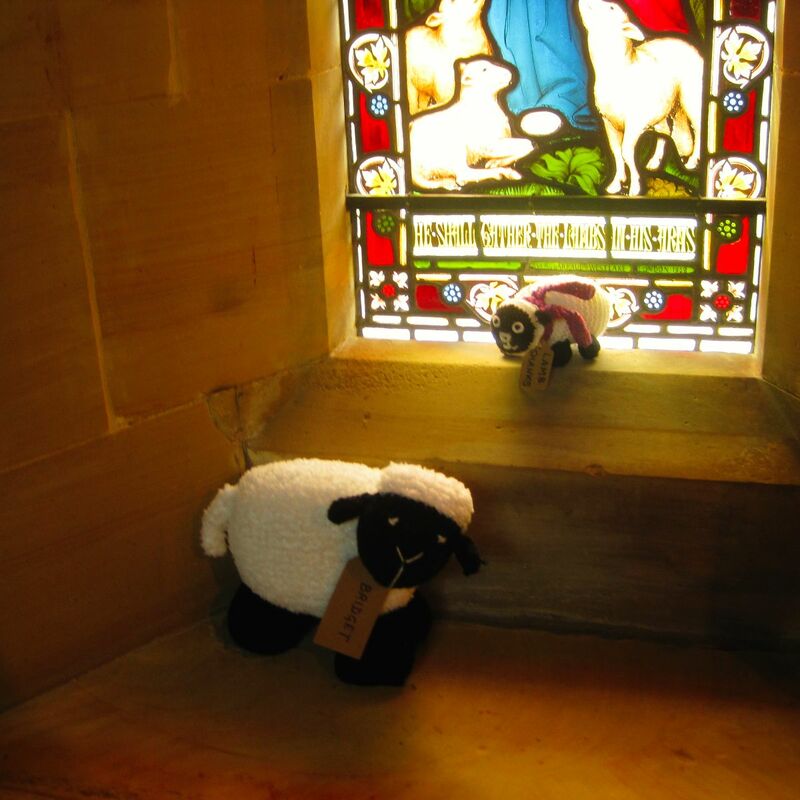 · Find some pictures of this scene – you almost certainly will have received one on a Christmas card! – and think about what the artist who drew it wanted to say about this moment. · Pray for women today for whom pregnancy may bring sorrow and challenge as well as joy. We often dismiss dreams as mere mental junk that is rattling round our heads, and perhaps we are sometimes right to do so, but in the ancient world they were taken very seriously as ways in which God, or the gods, communicated with people. All the angelic appearances to Joseph happen in dreams. Fortunately, he takes notice of them, as they contain vital messages which enable him to keep Mary and Jesus safe. · Do you often recall your dreams? Have you ever found messages in them which were important for you? Imagine you are Joseph, often the overlooked member of the Holy Family. 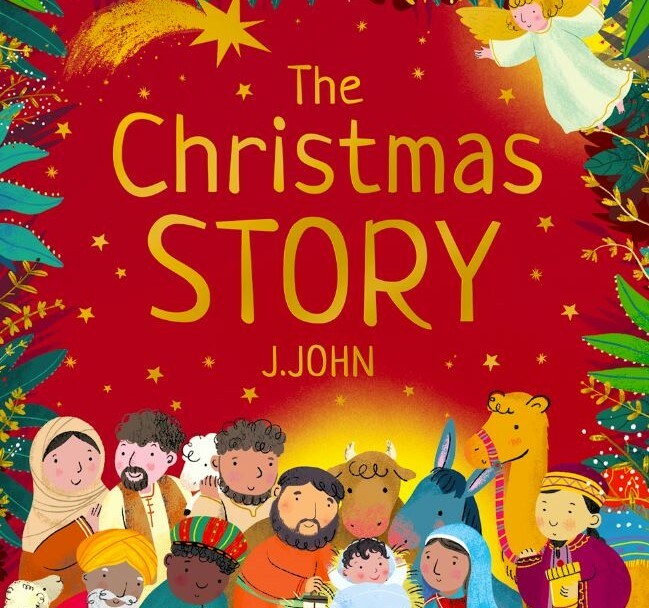 How do you feel as the story of the birth of Jesus unfolds? What kind of person are you? What motivates you to take on the burden of the birth of this child who is not even your own, biologically speaking? 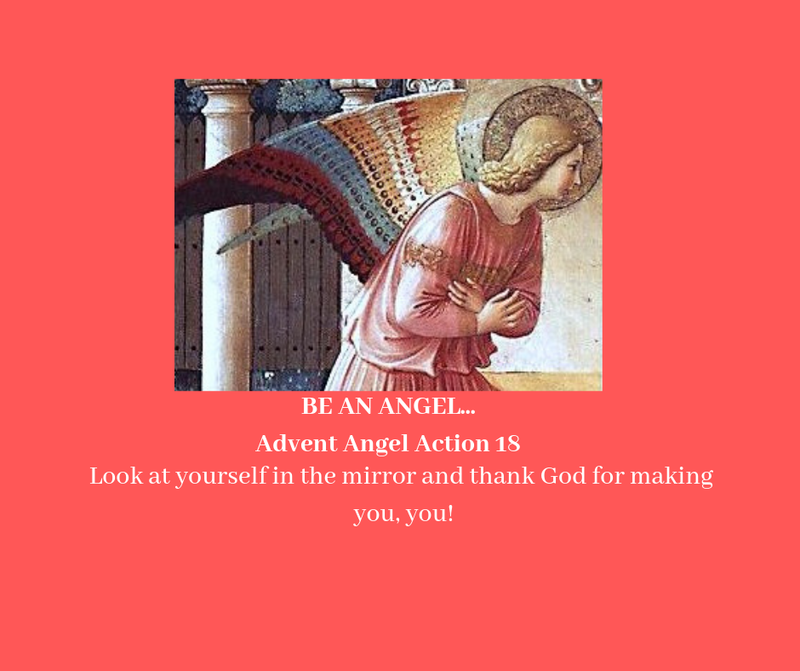 Finally we come to the angels you may have been waiting for, those involved in the Christmas story! The first of these is the angel who appears to Zechariah, the angel who identifies himself as Gabriel. Zechariah, like Abraham, has been unable to have a child with his wife, Elizabeth, and they now seem too old. But the angel tells them that God has other ideas. Elizabeth will bear a son. Not only that, but he will be the forerunner to the long awaited Messiah, the man that we will come to know as John the Baptist. Zechariah is a priest who is on duty in the Temple when this announcement is made. Everyone is waiting for him to emerge from the sanctuary where he is supposed to have been simply offering incense, but he has been struck dumb by the angel, unable to believe what he is hearing. Although he had gone to the Temple to serve God, it is as if he doesn’t really expect that he will actually encounter the divine. · When you pray or come to church, do you expect to hear God speak to you in some way? When was the last time that you felt God was speaking to you and how did this happen? · Gabriel says that the birth of their son will bring great joy to Zechariah and Elizabeth, yet we know that Herod will eventually execute him to satisfy the whim of his daughter and wife. The birth of children brings the possibility of joy and sorrow – do you think Zechariah and Elizabeth would have felt the same about this news if they had known how the story would end? 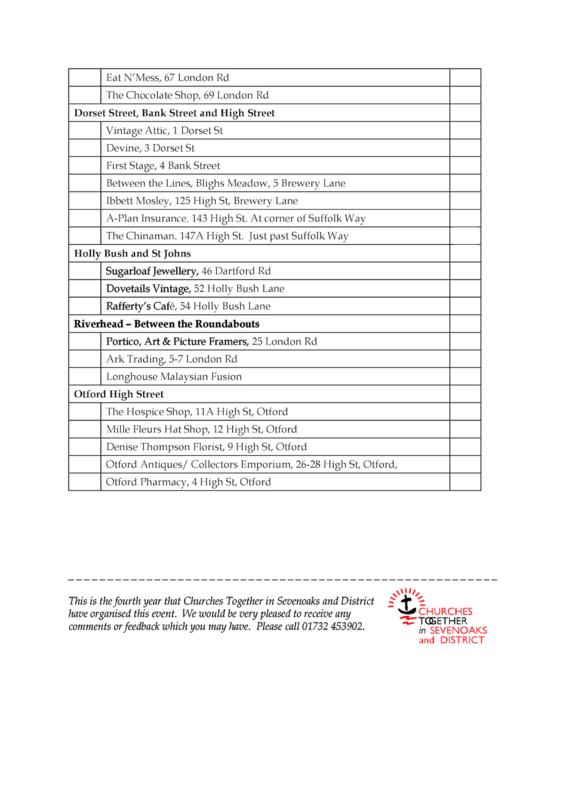 The accounts of the resurrection vary in detail in each Gospel. Mark has a “young man” announcing the news that Jesus has been raised, Luke has two men in “dazzling clothes”, but here in Matthew there is one person, identified as an angel, who descends from heaven, rolls back the stone and sits on it, waiting for those to whom he will deliver his message. No wonder the guards faint from fright. The angel tells the women who find the empty tomb not to be afraid, and sends them back to the rest of the disciples with a message of their own. In a sense, they become the angels – the messengers – to their brothers and sisters as they spread the news. · Have you ever been entrusted with an important message? What was it and how was it received? Was it joyful or painful for the recipient to hear? Did those who needed to hear it listen? · The angel’s announcement is that that Jesus had been raised. Life had conquered death. Do you need to hear a life-giving message today? Are there places in you which feel dead? · The women needed to go to the tomb, the place of death, to hear the message of life. Where might you need to go? If yesterday’s angels brought joy, today’s angels bring terror. Despite the images you may see in pictures of angels playing harps, and assorted other instruments, the only instrument which angels play in the Bible is the trumpet. In the book of Revelation there are seven trumpeting angels, each one announcing some new chapter in the devastation which is hitting the earth. Trumpets were used by armies to convey instructions to the troops in battle, from ancient times until at least WW1, and there was at least one bagpiper who piped the troops onto the Normandy beaches on D-Day. These are not angels who are providing soothing music as a backdrop to heavenly rejoicing, but angels who want to wake us up and get us ready for action. John, in exile on Patmos, wants his churches, from whom he has been separated to know that their current suffering is not the end of the story. God will intervene in world events to bring down the oppressive powers which rule them and bring in his kingdom. This can’t happen without conflict, though, and the disasters the angels announce are a symbol of this. · Have you ever had to hear and take on board bad, but necessary news? How easy was it for you to hear it? · Why are we so ready to deny the reality of bad news, like the challenge of climate change? · What realities do you need to accept at this moment, and what changes might you need to make to respond to them? The final group of angels are herald angels, those who have announcements to make which often change the lives of those who hear them. Abraham had been promised that he would become the father of a multitude (Genesis 12) but many years had passed and the promise had not come true. Abraham and Sarah were already very old, and it seemed as if this would never happen. Then, suddenly, out of the desert come three men. The account says that “the Lord appeared to Abraham”. Somehow, mysteriously, these three men embody the presence of God. Though they are not identified specifically as angels, they come with a message. God’s promise to Abraham is about to be fulfilled. Sarah will have a son. This passage is a good example of the rather ambiguous way in which Old Testament writers in particular tend to write about God and the angels, shifting without explanation or apology from the singular, “God appeared” to the plural “ three men”. It doesn’t really matter that they do this, however, as the meaning is clear. God is speaking, and his words make things happen. Sarah laughs when she hears that she will soon be pregnant; whether with delight or disbelief is not clear, but when her son is born she names him Isaac, which means “laughter”. These angels have brought her the joy she has always longed for. · What is the most joyful announcement that has ever been made to you? · Have you ever had an unexpected encounter which has changed your life? Come and join us for our Christmas services. Everyone is welcome at everything. 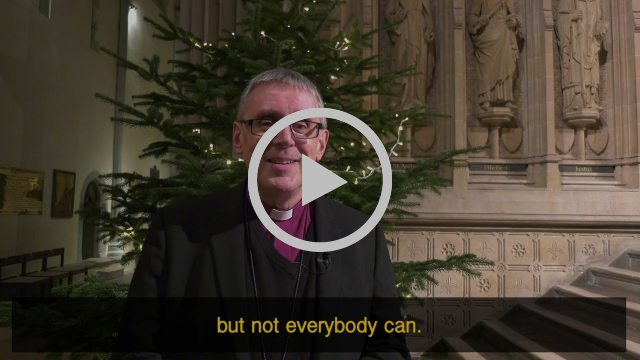 To get you in the Christmas mood, here is a track recorded at our Carol Service last Sunday. music Adolphe Adam, words John Sullivan Dwight, arranged Philip Le Bas. Seal Children's Choir at their first "big gig", opening our Carol Service on Sunday. Posted with permission of their parents. Well done to all of you - I was really delighted! Children's choir starts again on Wed Jan 9th from 5 -5.30pm in the church hall. It's for any children between YR and about Y5 - fun songs and singing games with me, and the occasional performance too, if there's an opportunity. Older children and adults are welcome to join our Church Choir, which rehearses on Wednesday evenings from 7.30-8.30pm. The book of Revelation was written by an early Christian leader, exiled on the island of Patmos, who seems to have been responsible for a group of seven churches in what is now western Turkey. Unable to be with them anymore, he has a vision in which he is told by “one like a Son of Man” to send messages to the “angels” of each church. The word “angel” here is ambiguous. What does John mean? Does he imagine that each church has a guardian angel, or is this “angel” somehow the essence of the church, its spirit? Could it even be that the messages are for human messengers who will take them to the churches concerned? We don’t know, but the clear implication is that though he can’t be there with these groups of Christians, they are not alone. They are watched over and remembered by God. · We hear the messages God wants to send to each of John’s churches, but what might the message be that the “angel” of our church might deliver? What might we need to hear? · How does it change the way we feel about our church to think that there is an angel of God watching over it? Might it make us take ourselves more seriously as a Christian community? In this passage, Jesus tells his disciples that, though the priorities of the world in which they live don’t apply in the kingdom of heaven. In a society which gave very little value to young children, he proclaims that it is children, and others who are vulnerable, who come top of God’s agenda. Their angels stand before God in heaven, in the front row, so to speak ; God notices them above all others, and so should those who follow him. In an age in which the enormous extent of the abuse of children – common throughout history – has been increasingly coming to light in all sections of society, including the church, this passage is especially powerful. Attitudes which idolise and prioritise the mighty which were common in Jesus’ time is still common today. It is often hard to hear for the quiet voices of those who have little influence. Jesus reminds us, though, that while they may not have the world’s ear, God does not miss a single cry for help from them. · When you were a child, do you recall times when you felt your voice was not heard, or when it did not occur to you to speak up? · Think of any children in your life now – family, friends, church members. How well do you really know them? How often do you get down to their level and really listen to what they are saying? After Jesus’ resurrection and ascension, his followers continued to spread his message. The Roman and Jewish authorities, who thought they had crushed the threat to their power by crucifying Jesus, found that instead, the trouble seemed to have multiplied. A savage wave of persecution followed. James was killed and Peter was thrown into prison. The church “prayed fervently to God for him” and in the middle of the night, an angel appeared to him in his prison cell and set him free. He thought he was dreaming, and so did the members of the church. Rhoda, the woman who answered his knock at the door, initially left him standing outside, because she was so surprised to see him there. The story doesn’t promise that nothing bad will happen to Christians; it begins by telling us about the killing of James. It does remind us, though, that we are not forgotten by God when we are in trouble, and that the concern and prayers we offer for one another is not wasted. · Why do you think prayer matters, if you do? Does it matter to you if you know others are praying for you? · The angel in this story is a messenger proclaiming liberation. Is there anything you feel you need liberating from? The famous story of Daniel in the lions’ den is set at roughly the same time as yesterday’s story, though now Nebuchadnezzar has been succeeded by King Darius. His courtiers, jealous of the power he has given Daniel, another of the Jewish exiles, cook up a plot which will not only – they think – get rid of Daniel, but also make Darius the author of Daniel’s misfortune. Darius doesn’t seem to realise that forbidding the people of his empire to pray to anyone but him will put Daniel in an impossible position, but once the edict has been made, according to the customs of his nation, even he can’t undo it. Much against Darius’ will, Daniel must be thrown to the lions. The next morning Darius comes to the den fearfully, sure that he will find no more than a pile of bones, but Daniel is safe. He says that “God sent his angel and shut the lions’ mouths.” We never see this angel, but Daniel is in no doubt that God has intervened to save him. Although this story is set in a world far removed from our own by time and distance, political manipulation of the kind which lands Daniel among the lions is just as much a reality now as it ever was. The story of Daniel reminds us, though, that God affirms those who act with integrity. · What “lions” have you faced in your life? Have you ever feared being torn apart, emotionally, physically or spiritually? · Pray for those who suffer because they have acted with integrity. Could you do something to support the work of Amnesty International or Freedom from Torture which works with the “Daniels” of our own day? This story is set in Babylon, where the Jewish people had been taken into exile. Three young Jewish men, Shadrach, Meshach and Abednego, have found favour with King Nebuchadnezzar and risen to high office in his court. But Nebuchadnezzar is a megalomaniac, and decides to set up a golden statue of himself and command that everyone should bow down before it. Shadrach, Meshach and Abednego, as good Jews, are not prepared to do this, and as a result, are thrown into a furnace so hot that that the flames kill those who put them into it. · What do you think of this story of miraculous deliverance? What about those who are faithful and yet are not delivered from trouble? Can this story still be an encouragement to them? · The angel in this story does nothing except be present with the three men. Is it sometimes enough simply to know that God is with us, even if we are not miraculously delivered? Have you experienced this in your life? Abraham has been promised that God will give him more descendants than the stars in the sky, but as he has been able to have no children with his wife Sarah, and she is now too old to expect to bear children, he can’t understand how this can be. Sarah gives him her servant girl, Hagar, so that she can bear a child for them, but then becomes jealous when her son Ishmael is born. When Sarah eventually gives birth to Isaac, Ishmael and Hagar are, essentially, not needed any more. Sarah insists that they be driven out into the desert. Hagar knows that she and the child are bound to die there, unprotected and without water, and leaves Ishmael under a bush so that she won’t have to witness his death, but just when she had given up all hope, an angel appears to her, and points her towards a well of water, promising that she and the boy will be saved, and that God will make a great nation of them too. She has met this angel before, when she was pregnant and ran away from the ill treatment of Sarah. Then the angel sent her back, but now he leads her away to a new life. In this story, someone who is among the most powerless people in the Bible, a powerless slave woman, is protected and honoured by God. She is a reminder that God works through people who may be overlooked by everyone else. · Who can you think of, in your family , church or neighbourhood whose voice might be unheard or discounted? · Imagine encountering their “guardian angel” – what might the angel say to you about the way they are treated, and how might you reply? The book of Tobit is in the Apocrypha, a collection of writings not included in all Bibles. It is a story about a virtuous man called Tobit, who has become blind. He sends his son, Tobias, to retrieve some money of his, which he has left with a fellow Jew in Persia, so that he can be given a proper burial when he dies, and his widow be provided for. 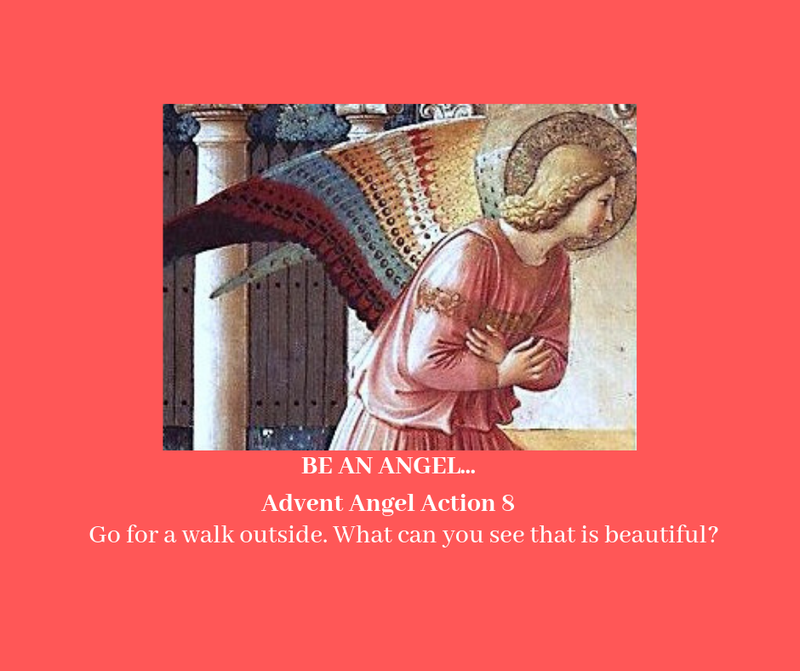 Tobias is anxious about the journey, but when he goes out to look for someone trustworthy to go with him, he is met by a young man who turns out to be the angel Raphael. It is a story which is well worth seeking out, if you haven’t got it in your own Bible – the Bibles in the pews in Seal Church include the apocrypha. This story seems to have been much loved in the Renaissance – there are many versions of it, though Raphael is usually depicted as having a splendid set of wings, so it is hard to see how Tobias didn’t notice there was something strange about his friend! The story of Jesus’ temptation in the wilderness, told very briefly in Mark’s Gospel, unlike Matthew and Luke’s version, ends with the enigmatic statement that “the angels waited on him”. No explanation is given of what these angels are doing, but the impression is that they are in some way caring for him. The wilderness was regarded in the time of Jesus as a place of danger, the haunt of demons, literally a wild place, where wild things were. Jesus has met one of those “wild things”, the rebel angel the Bible calls Satan, the accuser. He has not given in to his temptations, but at the end of such a struggle it is easy to see how he might need the ministry of the angels. · When you have been through a tough time, what helps you to regain your balance and energy? · Who or what are the “angels” you need to wait on you, the messages you need to hear at that time? The next group of angels all in some way protect or guide people, so I have called them all Guardian Angels. The Israelites are being led by Moses through the desert on their way to the Promised Land of Canaan, but the lands through which this caravan of ex-slaves passes is not empty. It belongs to various tribes, none of whom are pleased to see this huge crowd enter their territories. What if they decide not to move on? Balak, the king of Moab, decides to send for a Moabite holy man, Balaam, to curse the Israelites. Numbers 22.1-21 describes how Balaam is reluctant to go at first – he recognises the power of the God of these people. Eventually he concedes, and sets off on his donkey to meet the King near where the Israelites are encamped. In the story in today’s reading, though, we discover that, though Balaam is now keen to make the journey, his donkey has other ideas. The donkey can see what Balaam can’t, that there is a large and ferocious angel barring the way. Eventually the donkey points this out to Balaam (this is one of only two “talking animal” stories in the Bible – the other is the snake who talks to Eve in the Garden of Eden). In the end, though Balaam does meet with King Balak, he refuses to curse the Israelites. He cannot curse what God has blessed. · Have you ever found the way ahead that you wanted to take blocked? Looking back have you ever seen that this was actually a good thing, even if it felt frustrating at the time? · Whose voices do you listen to when you need to make a decision? Do we sometimes need to pay attention to the voices of the “donkey” , the voices we are tempted to write off as unimportant? The story of Gideon is almost comical. The Israelites, only fairly recently settled in the land of Canaan after the exodus, are being attacked by their neighbours, the Midianites. There are no kings, and effectively no formal government at the time; Israel is led by “judges”, people chosen for their military prowess or wisdom. At this time, however, there is no clear leadership. As the story begins, Gideon, a farmer, is hiding himself and any produce he can from the rampaging Midianites who are laying waste the land. He is terrified. When the angel of the Lord appears suddenly in front of him and addresses him as “you mighty warrior” Gideon is dumbfounded. Surely the angel doesn’t mean him? He is, as he points out, the least in his family, which is part of the weakest clan in the tribe of Manasseh. The angel is adamant, though, and eventually Gideon, however fearfully, accepts the challenge of confronting the Midianites. He is a wonderfully human character, a mix of courage, fear, foolhardiness and genuine faithfulness to God. Do you recognise anything of yourself in Gideon? · The angel sees something in Gideon which he cannot see in himself, that he is a “mighty warrior”. Has someone else ever seen something in you which you have been blind to? Jewish theology, and the Christian theology which followed it, held that angels had free will, just as humans did. By the time of Christ, an idea had taken root that some angels had rebelled against God and were determined to try to influence the world for evil. A figure who had originally been simply considered to be a member of the heavenly court appointed to test humanity, called the Accuser (the Satan, in Hebrew) gradually morphed into what was now called the Devil, a figure of evil. He was still a creature, not an equal of God, but was often seen as the moving force behind the evil in the world. In the book of Revelation the Satan (described here as a dragon) and his angels fight with Michael, the warrior archangel of God. It is a bitter battle, but there is no doubt in the writer’s mind about the outcome. The Satan and his angels are God’s creation, however wrong they have gone, and ultimately under his control. The book of Revelation was written by an exiled Christian leader at a time of persecution by the Romans. He speaks in coded language of the struggles against oppression which he and his fellow Christians are going through. It may seem that they are in the grip of evil, but it will not last forever. God is good, and his love will eventually triumph over evil. · What difference does it make to the way we live our lives if we believe that love is stronger than evil? · Have you ever experienced a real struggle between the temptation to do evil and good in your life? What happened? You can find the Gospel accounts of Jesus birth and the events that surrounded it here. The king of Aram has been waging war on Israel, but every time he tries to attack, the Israelite prophet Elisha hears from God telling him where the attack will fall. Eventually The king of Aram realises that Elisha is the fly in the ointment, and resolves to get rid of him. He sends a large and well-equipped army to surround the prophet’s house in the middle of the night. When Elisha’s servant gets up in the morning, he is (rightly!) terrified at the sight of all these soldiers, hell-bent on eradicating Elisha, and presumably him as well. Elisha, though, does not seem afraid, and asks God that his servant’s eyes should be opened. “Do not be afraid,” Elisha says to him “for there are more with us than there are with them.” The servant sees that the mountains all around them are filled with an even greater army, the army of God, with all its horses and chariots of fire. · Imagine you are the servant in this story. What might it feel like suddenly to see that you are not alone and that “there are more with us than there are with them”? · When you are going through difficult times, what sources of strength outside you do you have to call on? 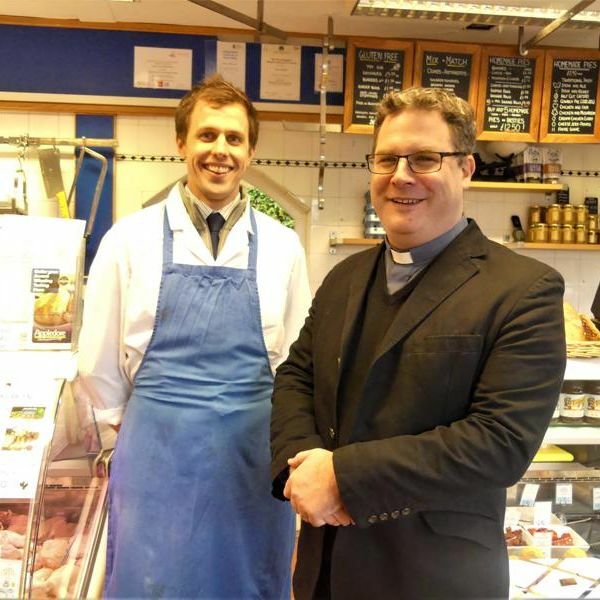 Welcome to the December edition of Rochester Diocese's monthly e-newsletter. New Magazine for the Diocese has arrived! 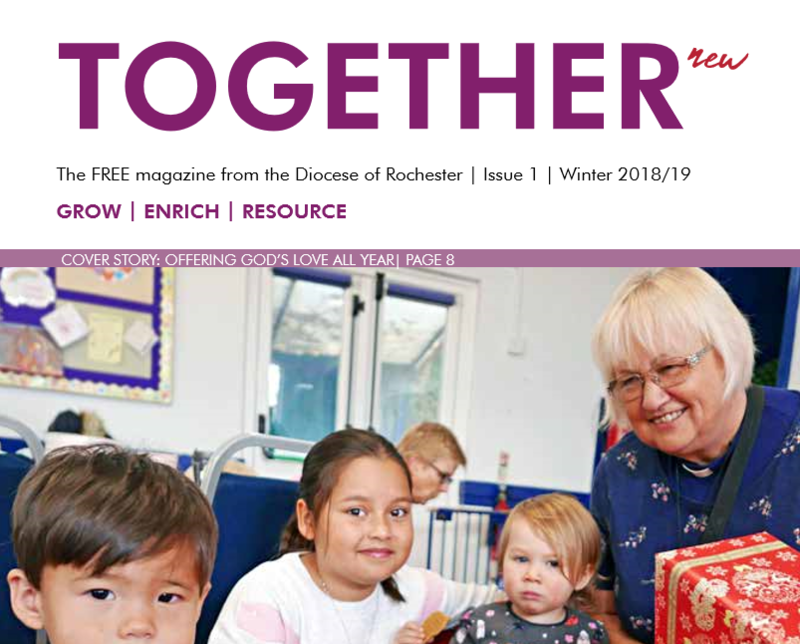 Our new quarterly magazine Together has now arrived to shine a spotlight on the life, faith and work of the Church locally. Bishop James is encouraging churches to make sure their Christmas services are updated on the national A Church Near You (ACNY) site. Every church has a free ACNY page and with half a million visitors expected to the site in December alone, now is the perfect time to start. Find out why here. 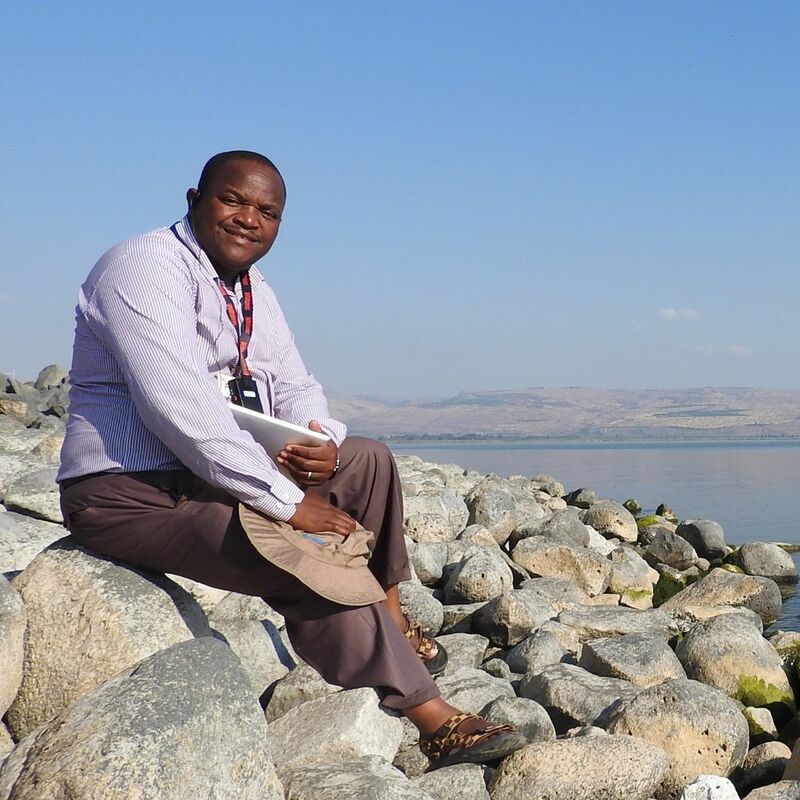 Bishop James has welcomed news that the Very Revd Dr Farai Mutamiri (pictured), former Dean of Harare Cathedral will be the next Bishop of Harare. Bishop James is in Zimbabwe during December, with whom we have a valued companionship link, to mark the retirement of the current bishop, Bishop Chad Gandiya. 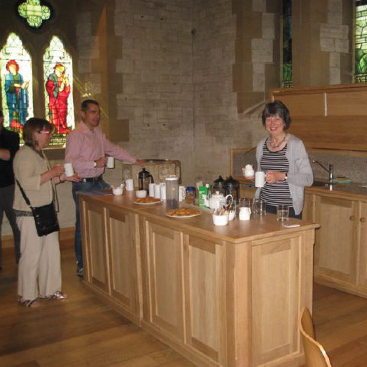 Read a Church Times article here. 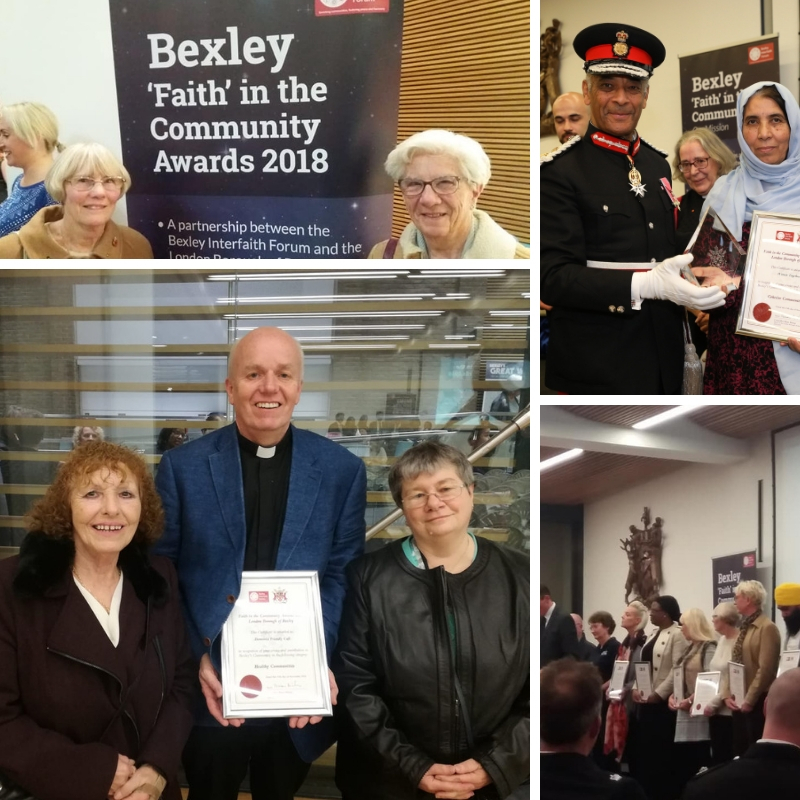 The safeguarding of children, young people and vulnerable adults in our churches is of utmost importance and the Diocese takes its responsibilities in this area very seriously. 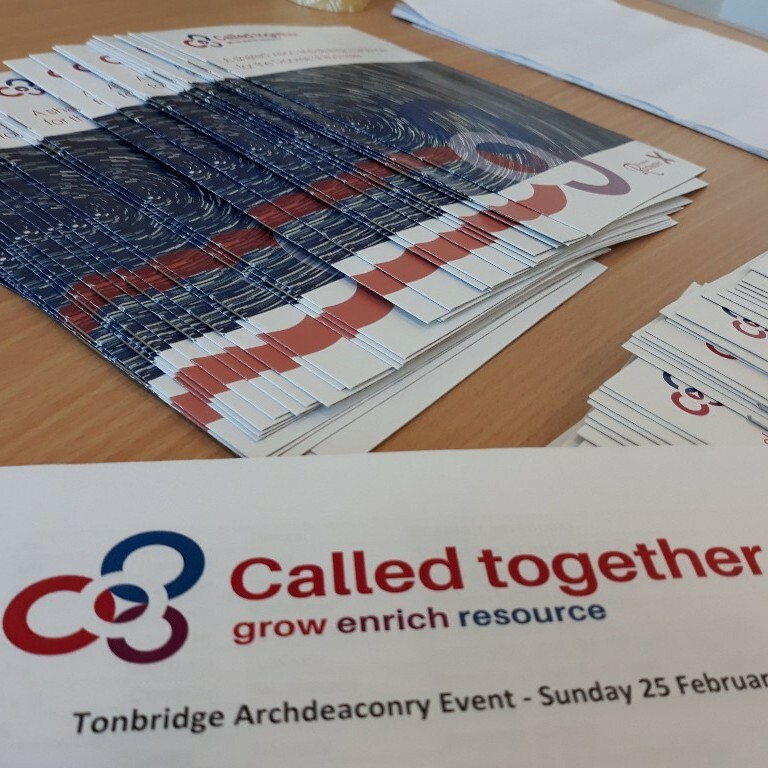 We have a range of policies, forms and advice notes as well as a regular programme of training to assist parishes with their safeguarding needs. 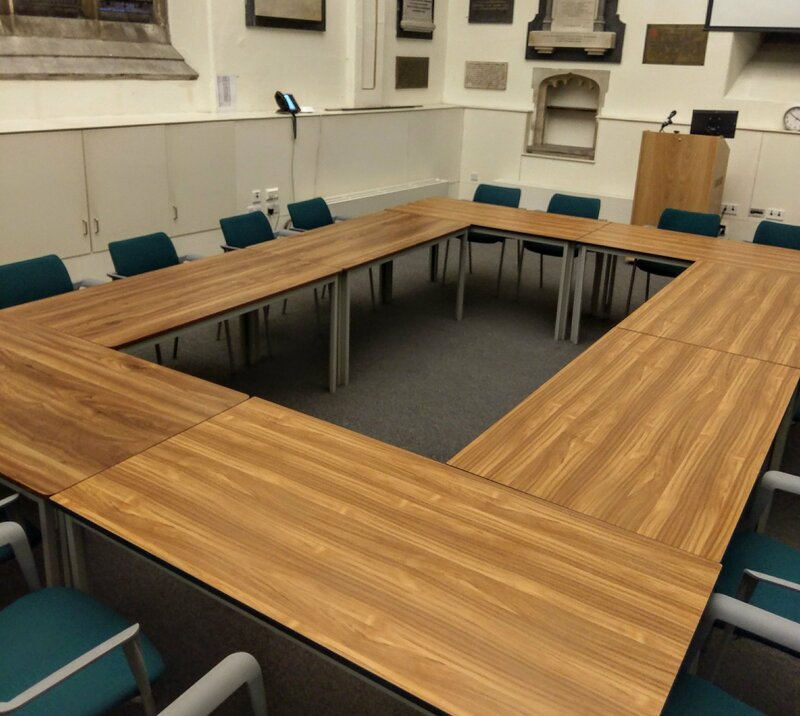 If you have any questions about Safeguarding, or need to report an issue, please contact the Safeguarding team here or call them on 01634 560 000. Top resources to support you in your work, life and faith - or just to share with others. 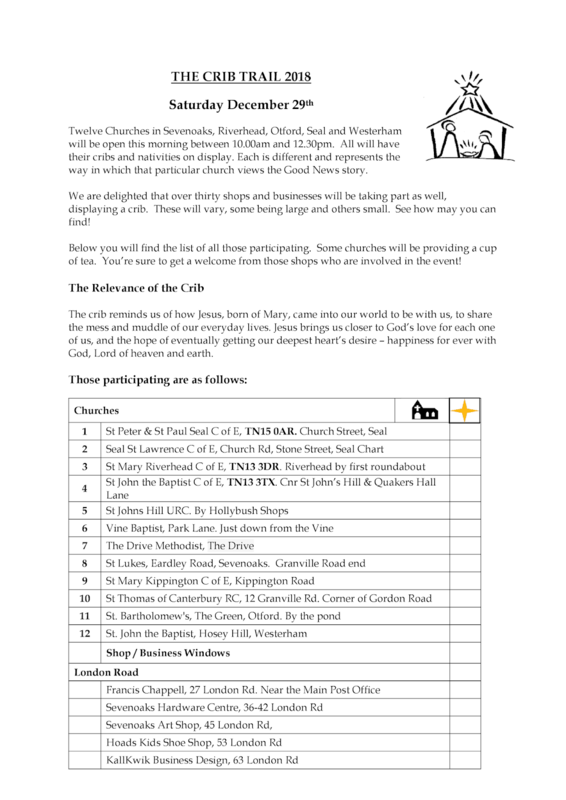 View local and Diocesan events in our What's On Calendar. Add your own event too! Explore the courses available at the St. Benedict's Centre here and St. Augustine's College of Theology here. Bethlehem: Town of Hopes and Fears - December 9, 6pm, St Matthew’s Church, Wigmore, ME8 0NX An opportunity to remember and pray for those living in 21st Century Bethlehem, with pictures and recent reports from the place itself - organised by the Diocesan Friends of the Holy Land. 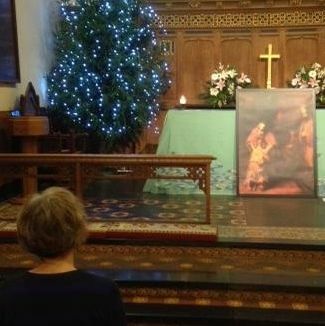 Dementia Friendly Carol Service - 12 December 2.30pm to 4.30pm, St. Matthew's , Wigmore, ME8 0NX This is an informal service for those who find it difficult to take part in more traditional Carol Services. We will sing favourite carols followed by refreshments and time to chat. 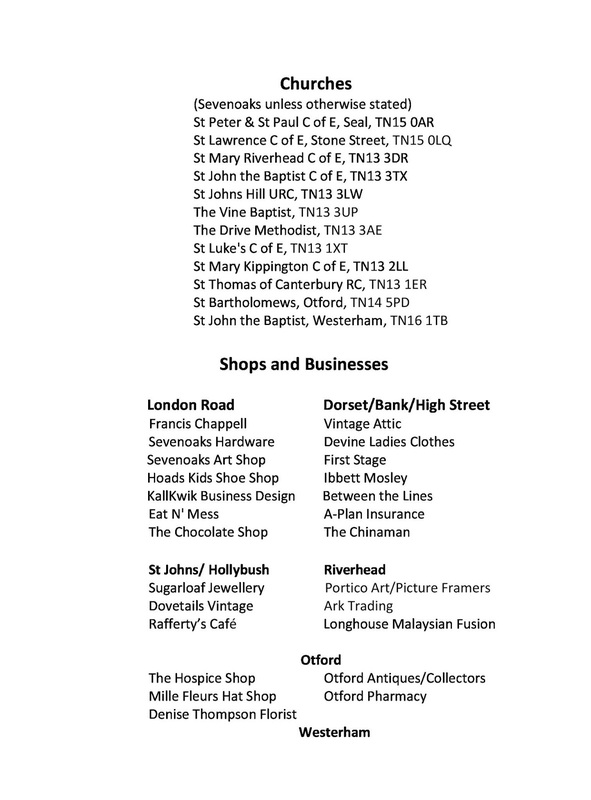 Christingle 50 Years - Saturday 15th December, 12.30pm, Rochester Cathedral. The Children's Society is celebrating 50 years since the first Christingle service. Join this special service led by the Diocesan Youth Council. Copyright © 2018 DIocese of Rochester, All rights reserved. 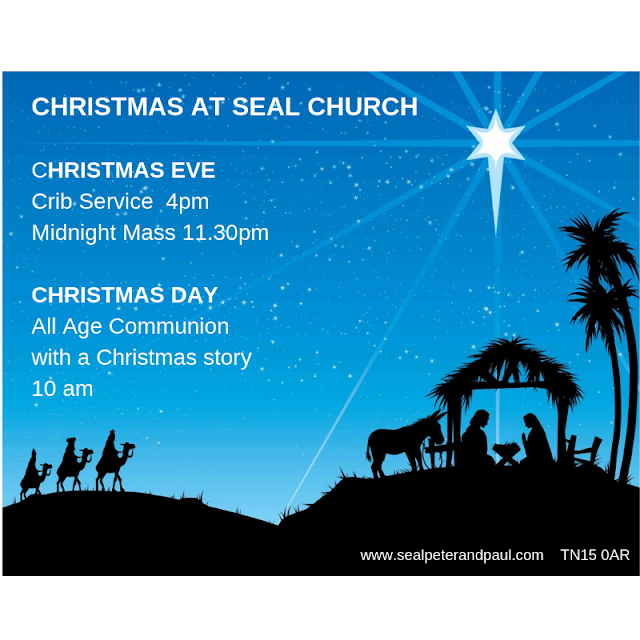 YouTube slideshow of Seal Church, with thanks to Nigel Fowler Sutton. 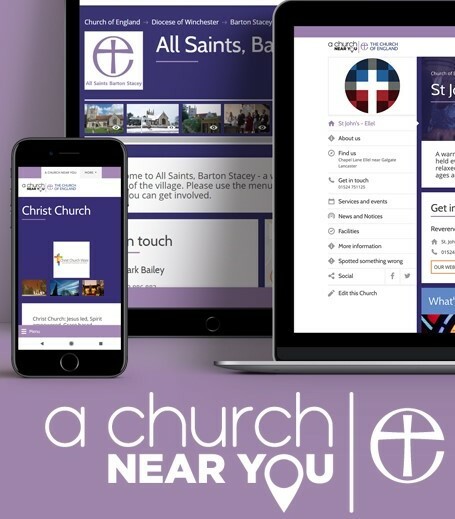 Visit the church website for more information about our church life, as well as details of how to arrange baptisms, weddings and funerals at Seal Church. Would you like to get married at Seal Church? We'll be delighted to help. 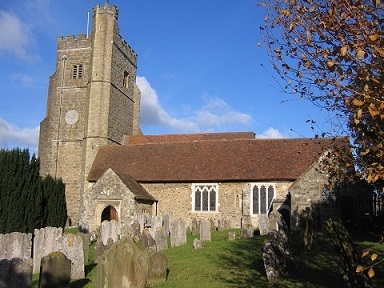 It is nearly always possible for you to be married here at Seal Church, even if you don't live in the parish. Just get in touch with the vicar to talk about it. Weddings cost between £489 and £774 depending on what "extras" you have, but if money is a problem we may still be able to help, so don't let that be a barrier. Church weddings don't have to be big or fancy. Brides don't have to wear white. You don't have to be churchgoers. We'll be happy to help you plan a wedding that suits you, as far as it is legally and practically possible to do so. Seal Church is registered with Inclusive Church and supports its aims and values. Seal Church is part of the Church of England, and is in the Diocese of Rochester. I'm the parish priest of St Peter and St Paul, Seal. 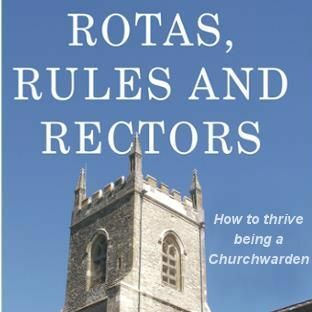 I've been in post here since 2006, having previous served in various parishes in Gosport and as a Deanery Schools worker. I am married to Philip, a bassoon-playing physics teacher, and I have two grown-up children - Michael and Ruth - from my first marriage. 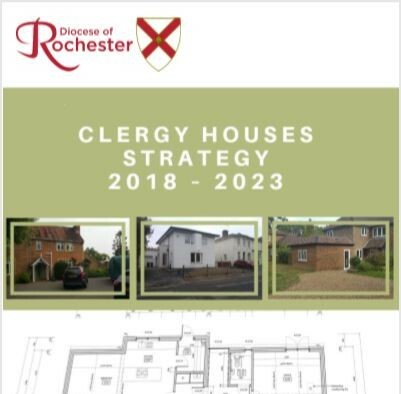 The postings on this site are my own and don't necessarily represent the views of the Diocese of Rochester, Bishop of Rochester or Church of England.